Thursday, 31 October 2013. 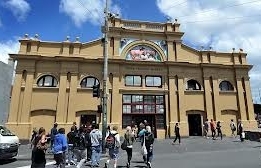 The City of Melbourne will make the largest investment in its history to preserve and renew the Queen Victoria Market, creating an expanded market precinct. Making the announcement today with Premier Denis Napthine, Lord Mayor Robert Doyle said that the City of Melbourne will seek UNESCO World Heritage listing for Queen Victoria Market following a comprehensive renewal program. “The renewal of the market presents a once in a century opportunity to create a world class market precinct. “Investing now will ensure that the Queen Victoria Market is part of our city forever. We want to preserve and celebrate the market’s iconic features while retaining affordability and ensuring the market is competitive in a changing retail environment,” the Lord Mayor said. The Lord Mayor welcomed the decision by the Victorian Government to enable the extension of the market precinct by transferring Crown land located at the southern end of the market to the City of Melbourne. As a result of the transfer, freehold land will be created, providing opportunities for commercial development to add to the vibrancy of the area. The funds secured through the development of this land will be reinvested in the market. The land changes will remove two roundabouts and improve pedestrian and traffic connections around the market. “Providing this land to the City of Melbourne will enable the QVM to expand its footprint and cater for the growth in patronage which is expected to reach 17 million annual visitors by 2031,” Premier Naphine said. The Lord Mayor said these changes created a unique opportunity for the market precinct to become an important civic and community focal point of the CBD’s northern fringe. “Key upgrades could include new public open spaces, essential infrastructure for traders, event spaces, improved car parking and pedestrian access. We have an invaluable opportunity to create dynamic spaces for events and activities, bringing new vitality to the market precinct, particularly at night and outside current hours of operation. The Lord Mayor said that in the next 20 years the number of people living within 800 metres of Queen Victoria Market will almost double from 67,000 to 128,000. “Despite the growth, traders have told me that business is tough. I have listened to their concerns about parking, infrastructure and the needs of customers. The time to act and invest is now. Our research indicates that retail spending at the market could be three-fold following a renewal process. The renewal of the Queen Victoria Market will be funded through a combination of revenue sources and carefully managed through a best-practice governance model. The Lord Mayor emphasised that plans for the market and the surrounding precinct would be developed over the next two years, with the renewal project phased over the next decade. The market will continue to operate during this time. Depending on the scope of the projects undertaken it is estimated that the renewal could generate 9,000 new jobs at the market, 12,000 jobs in the surrounding precinct and thousands of construction industry jobs. The Lord Mayor emphasised that the long term suite of projects would be coupled with a comprehensive community engagement process. “We know Melburnians are passionate about our great trading lady and we ask people to participate in this discussion and to help us arrive at the best possible outcome for the market, the city and Victoria,” the Lord Mayor concluded.